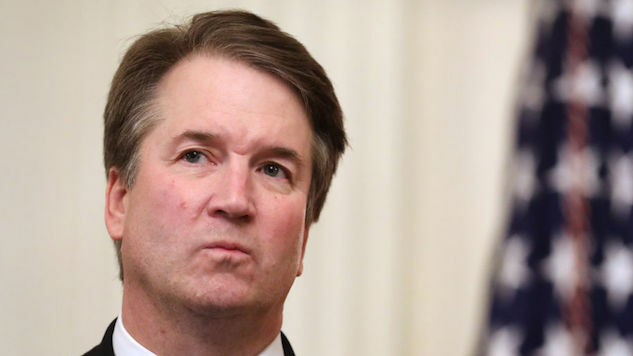 In 2012, Trump’s Supreme Court nominee Brett Kavanaugh sided with Trump Entertainment Resort in an effort to prevent unionization at one of Trump’s casinos. Newly resurfaced votes by Kavanaugh reveal his tendency to side with companies rather than employees, and could foreshadow a grim future for workers. Six years ago, Kavanaugh and two of his fellow Republican judges on the D.C. Court of Appeals voted unanimously to throw out an order by the National Labor Relations Board that would have required the Trump Plaza Hotel and Casino to bargain with the United Auto Workers. The dispute began in 2007 when UAW held an event with federal and state lawmakers to announce that they had majority support at the casino to form a union. A vote was conducted, with 324 workers in favor of the unionization and 149 against. However, Trump claimed the results should be thrown out because the press coverage of the event that took place before the vote had a great influence on the workers and swayed them to join. NLRB precedents enforce that if any actions or events make the board appear biased, the election is invalid. Yet in this case, the NLRB stood behind the pre-vote event and argued that none of their actions were biased. By 2010, the dispute had come to Kavanaugh in the Court of Appeals for the D.C. circuit. The attorney for Trump’s company accused UAW of organizing an “elaborate hoax” when they held the pre-vote event that ultimately created a “bandwagon effect.” They went on to argue that employees didn’t vote against the union because the event made it seem like the pro-union workers would win no matter what. In response, Kavanaugh told the NLRB’s attorney that it “defies common sense” to argue that the pre-vote event wasn’t widespread and impactful. In the end, Kavanaugh joined in on his colleague’s opinion that ruled the NLRB had wrongly “ignored the substantial circumstantial evidence.” The NLRB’s order was thrown out and the agency was asked to reconsider the case. The case remains open, despite the fact that the Trump Plaza Hotel and Casino closed in 2014. Following the Trump Plaza case, Kavanagh sided with companies instead of employees in two more revealing cases. In 2014, he wrote in a dissent that the Occupational Safety and Health Administration “overstepped its statutory authority” when they punished SeaWorld. OSHA fined SeaWorld for “improperly protecting employees” after a killer whale yanked a trainer into the water by her hair and drowned her. In a 2-1 vote, the court upheld OSHA’s fines even if Kavanaugh wasn’t happy about it. In 2015, Kavanaugh voted with the majority against the NLRB in a dispute with the Adelson’s Hotel. The court upheld that the hotel had a First Amendment right to issue citations against pro-union activists protesting on hotel property.